The first Renaissance Faire of my insanely packed costuming season is coming up this Saturday, and I pulled out my clothes to play dress up and see what I wanted to wear. I have a much-loved-but-seldom-worn blue and ochre wooly/lineny ensemble I've only worn once, so I've decided to give it some love this year, but it needed some attention. Mostly I was concerned about the weather. It's been very odd this year, go from snow to summer sunshine back to snow again, with very little warning. Rather freakish, really, and Valhalla Renaissance Faire has a history of being precipitated upon, so it's always a good idea to bring cold-weather gear just in case. For me this mean either making a pair of sleeves, or forging ahead to make the 1570s waistcoat (jacket) I've always planned on making, to accompany. 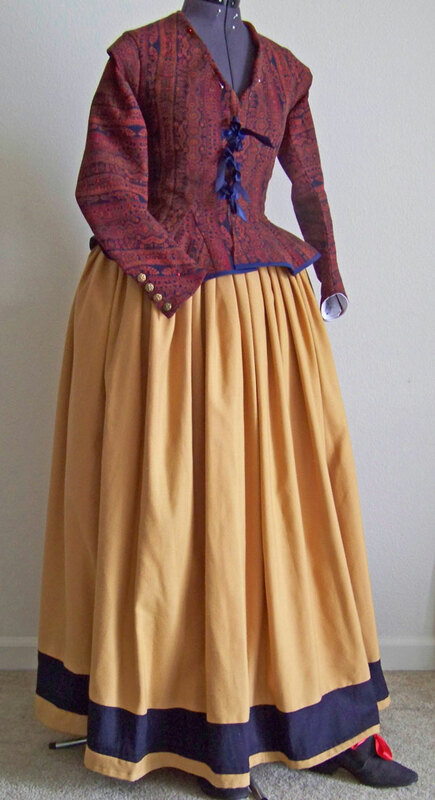 To make a loooong story short, what I've ended up doing is scrapping the blue gown, just wearing the ochre underskirt, and creating the red "carpetbagger" jacket, sleeves and all. I will have more photos after this coming weekend, but here is a preview. You can see that the neckline needs some readjustment. This is completely my fault - I had the pattern for the waistcoat, but ran into some fit problems when I added sleeves (set in sleeves, not tie-on). The front edges turned out a bit funky, so I've decided to fold them back and create more either a V or U shape (appropriate for the period, too), and let the shirt collar stick out. The waistcoat features 7 wide gussets that give it a considerable flare at the hips. 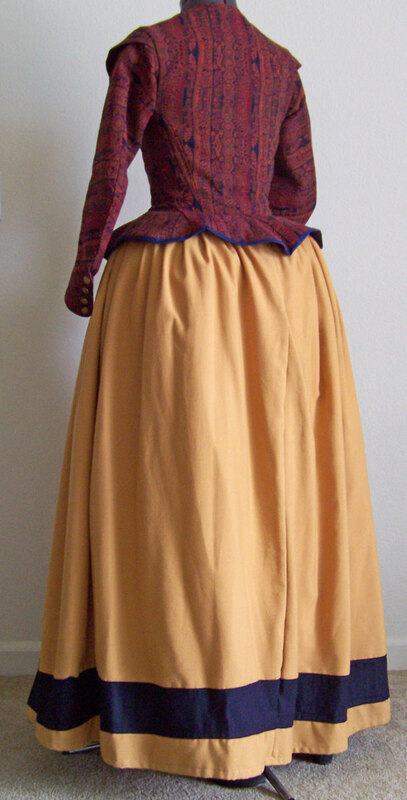 I like this kind of peplum, although using thinner gussets would give it a more trim appearance. The sleeves are set in with a little decorative wing, and the cuffs feature four vintage brass buttons each. If it warms up in the day, I can turn the cuffs back to mid-forearm, pin the shirt cuffs to them, and stay a little cooler. 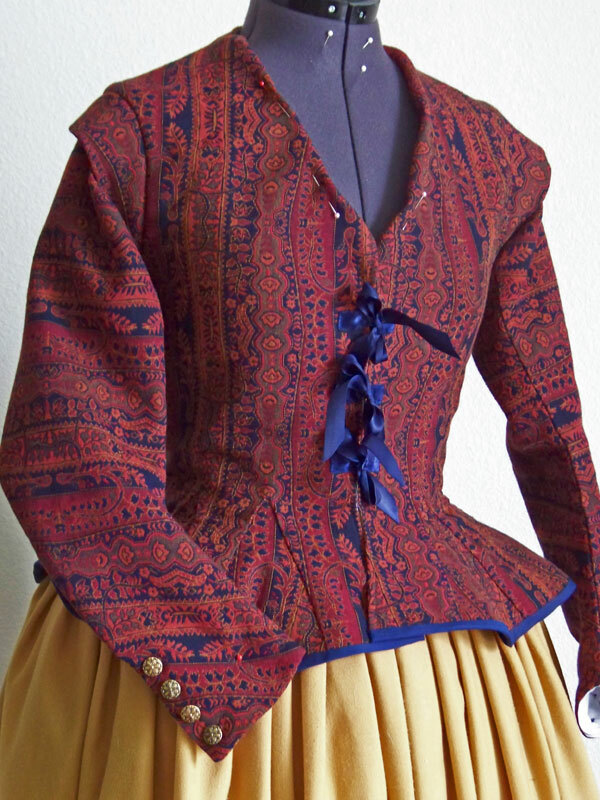 The front edges of the waistcoat fasten with coat hooks, and have ribbon ties inbetween. I know two-looped bows are not period accurate, so I may wear them just knotted, as I like the way the ribbons hang down. 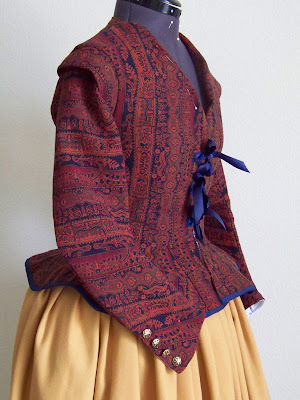 Funnily enough, I will be working on a 17th c. waistcoat (almost the exact same pattern), in the coming months, and will be sure to post about it. I need to do some work on this pattern, but I look forward to working with it again, as it's one of my favourite period pieces! I just started reading your blog a week or so ago, and totally hooked.. and now I find out I'll be seeing this beautiful waistcoat in person? Wow, so exciting! It's beautiful! Courtney, you're going to Valhalla? Yay! Be sure to come say HI. I will be there Saturday June 5th only. You're gonna look fabulous Lauren! I would love to play dress up with your costumes! Have fun! Thanks gals! Mrs. C, I'm surprised there aren't faires in NZ. I thought it was a world-wide epidemic. I'm not sure you would like them, though - renaissance faires are "special places," lol! I'll be sure to get photos on Saturday and post them. Lauren, I just wanted to thank you for the sweet comment you left on one of my posts several days back, as well as for the beautiful ribbon cockade that arrived the day I returned home from the hospital. It's absolutely gorgeous and I can't wait to find just the right hat to pin it on! Thanks, too, for the link to my "So Faithful a Heart" blog. I'm getting lots of hits every day from your blog! I have photos to post when I'm not too knackered to post them! Lynette - of course I will link to you! I love the whole blogging community and how we all help each other out, so I'm happy to do it, and I'm glad you're getting traffic!